Back in April, I asked you readers for specific situations you needed help applying logical consequences in, and we got quite the response! I am taking each scenario and breaking down how I would react and have reacted. Let’s go ahead and just broaden this to all difficulties during diaper changes. Not all children will specifically kick, but all will do something. Some might try to roll over. Some try to sit up. Some arch the back. Some grab at the diaper…oh the list goes on. This is another one of those things that is just going to happen. It will. Your child starts life out laying relatively still as you change the diaper, but one day, she will start to squirm and cause you trouble. First of all, let’s discuss something. Do what you can to keep things clean and your child safe. Don’t leave the child unattended at the changing table or on any surface. Perhaps buckling the child down will help keep your child more still (though not more happy). If you change your child on the floor or other surface that is not “baby deification proof,” put a pad under your baby or something so if and when baby creates a mess with the wiggling, it won’t be so traumatic for you. Next, I think the best thing to do with these diaper changes is to keep the child distracted. Distract, distract, distract. A baby does not want to hold still for a diaper change. Does she need to? Absolutely. But this isn’t a situation that requires complete reverence. If any experienced mom is like me, she finds herself trying to had her four week old a toy before she changes the diaper. I did this with both of my girls. I would put them down for a diaper change and try to give them a toy…then I realized they couldn’t hold a toy yet 🙂 It is so much a part of the habit of diaper changes, it is what we do. Keep some interesting toys at the changing table. Rotate often. I will also hand McKenna the new diaper to hold or her diaper cream. She likes to “brush” her hair currently, so I will give her a brush while I change her diaper. Distract, distract, distract. Sing songs. Engage your child. Talk about what you are doing. Explain you are taking her pants off. Talk about her having a messy diaper, then talk about it being fresh and clean. This is an opportunity to teach opposites and various concepts. Despite your best distracting efforts, there will be times your baby will not have it. She will not be deterred! I have had this problem with McKenna at times. This happens when she wants to sit up. Well, I just can’t change her diaper sitting up. I am not that talented. So I lay her back down, hand her something to play with, and tell her to stay down. I do this in a firm voice. I give her “the look.” I do not give in. You can’t really give in with situations like this; the diaper must be changed. If your child tends to make a messy diaper right when she wakes up, you can change her before any fun even begins. The older the child, the firmer I would be with not being allowed to move around during the diaper change. I think this is a situation that will be easier remedied if your child obeys you in other areas. Your child needs to know that when mom says no, it means no. So be consistent in all areas of life, not just the diaper change. If screaming and crying can get her out of other things, she will try it for diaper changes, too. Do distract. Go to the toy or other item to play with first. Also, sing songs, count toes, count how many seconds it takes, etc. Do go fast. Go as fast as you can go. Do be consistent. Don’t delay the diaper change if the fits come. Do repeat. You might have to do these things over and over again before your child gets it. Do warn. Give your child fair warning before the diaper change if she is old enough to understand it. I don’t really have any standout experiences with this. It is something my oldest and youngest did do or does right now. Kaitlyn wasn’t really ever too bad about this for the most part. Right now, it is prevalent in the life of barely 14 month old McKenna. She always wants to sit up. I lay her back down over, and over, and over again. It takes time, consistency, and patience. If I can give her something of interest, she will be just fine. But if I expect her to lay still with nothing to do, I will be laying down the little girl soon. This time period requires patience. You can both work through this. Hang in there! What is your favorite diaper rash ointment? Our son kicked when being changed a lot around 18 months. He did it to get a reaction out of us, not to hurt. He just wanted to play. We would stop the diaper change, with no expression, no talking, and just put our hand on his legs or chest with a small amount of pressure. We held our hand their until we could feel him relax. Then we would say "No kicking" in a soft firm voice and continue on. As soon as he kicked again we repeated the "consequnce". At first it took about 3 times during the diaper change until he stopped, but in a day or so it was only once, and then after a week the behavior was gone. We still do this when he gets restless on the changing table. What helped my son was giving him a "no no" item during diaper changing time. For example, he was not allowed to touch our cell phones. But we had an old one that didn't work. So we kept this on his diaper changing table and he got to play with it only during diaper time. We told him that it was his special diaper toy and he never got confused between what times it was and wasn't allowed to be played with. Interesting tid bit. My son was a terrible diaper change guy. Kicking, screaming, and convulsing. We finally got tubes put in his ears a month ago, not one single time since then has he screamed as I tried to change his diaper. My belief is that every time I laid him down, the pressure in his ears would build up causing pain. I always thought he was just being "strong willed" but now I believe he learned to associate diaper changes with pain. You would even show him a diaper and he would start wailing! Not any more! Another distraction idea we used was to attach a dresser mirror to the back of our change table (which is a dresser with a change pad on top). Our LO LOVES to look and "talk" to herself that she usually ends up laying on the change table for an extra 5 minutes after we have finished changing her diaper! Just to correct one important point, to avoid confusion for readers: Your title isn't correct, because the methods you are giving here aren't logical consequences. Logical consequences are sanctions that are tied in with whatever the child has done wrong – for example, taking a child's toys away for a few days if the child doesn't put them away properly, or making a child clear up something they've spilled. The ways you're describing of dealing with the problem of wriggling during diaper changes are perfectly good ones, but they aren't logical consequences, so that's the wrong title for them. I took some ribbon and attached a pretty basket to the end of my daughter's change table and filled it with a variety of toys/small books. Then I sit her on the change table and let her lean into it and pick her own toy. I also hung a memory board on the wall down low covered with pictures of out-of-town family members and we practice their names. Both of these things have really changed diaper time for me! Distracting with toys or singing is very helpful but many times we have had to do more. If our little boy is still wiggling or kicking we tell him he needs to lay still or he will go to his bed for a minute. If he still doesn't obey, a minute in his bed makes a big difference. We have done this starting at 10 or 11 months and its has alway helped. Cameron and Megan, I think that is an excellent example of a consequence working because you knew the intent behind the action. You reacted perfectly to curb his behavior based on why he was doing it. Thanks for sharing. Rachel, that is a good idea for distraction. Thanks! Val, thanks for sharing that! I think that is an excellent thing for parents to consider. PamKlip,great idea! Thanks for sharing that! Sarah, that is true, but this post is in direct response to a request for logical consequence ideas for squirming during the diaper change. That is the reason for the incorrect title, but you are correct. I suppose people who aren't regularly following the blog wouldn't know that.A logical consequence for the wiggling during the diaper change could be to buckle the child down, but that wouldn't fix kicking or anything. Cassie, thanks for sharing your ideas! Thanks to you too, proud mommy! 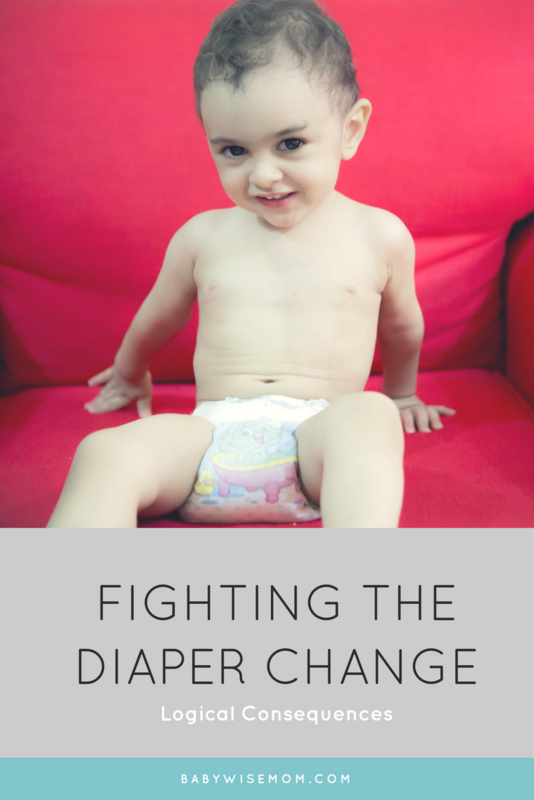 I keep coming back to this post because diaper changes have been a battle for months now, and my daughter simply will not listen. She often gets so angry she throws her toys at me (or anything else I give), kicks, screams, writhes.. even if I strap her to the changing table she twists her way onto all fours. I've tried distractions, talking to her, verbal commands (which she usually does well with unless it's close to bedtime), timeouts in her crib, etc. I'm about to go crazy over here. I'm pregnant and tired and patience is low. Any further advice? It would be most welcome! I came across another distraction method recently that might help someone searching here for ideas. Try putting a sticker on the child's nose or forehead. It will take a while to get it off. If you are really good at multi-tasking, you can grab the sticker just before they are successful and move it to another place, such as their forehead. Worth a try!